Why would you hire a Regular Interior Decorator when you Restore, Remodel, or Renovate your Historic Building when you can hire a Specialist with more than 19 years of experience? Original millwork is important to preserve. I’m Johanne Yakula of From Times Past Ltd., and I’m the only interior designer in Edmonton that specializes in heritage interiors. 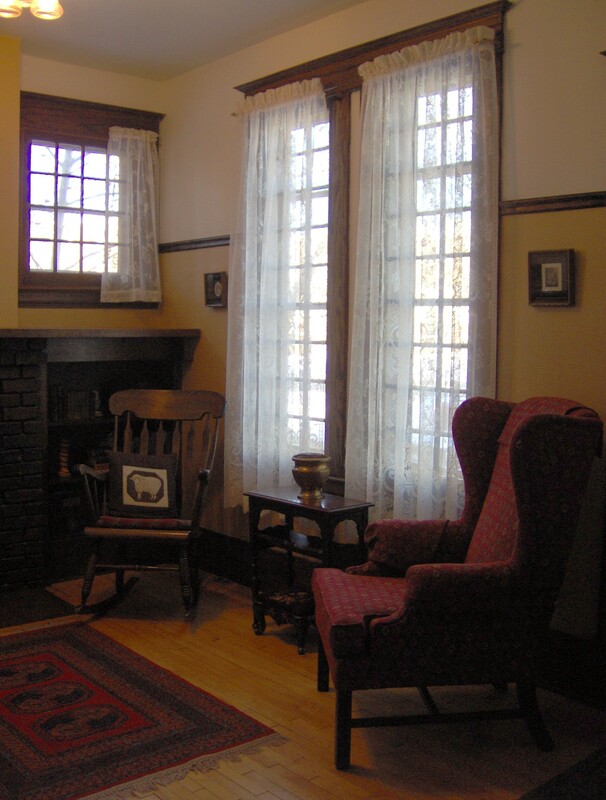 Restoring and decorating heritage buildings requires specialized knowledge. 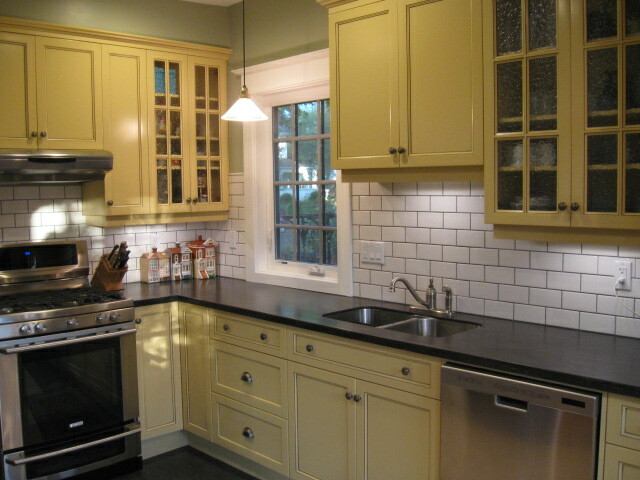 It’s not enough to choose finishes, create window treatments and plan spaces. Any designer can do that. What is important is the knowledge of how to do all of these things in such a way that respects and enhances the authenticity and historic integrity of the building. For over 19 years now I’ve been helping owners of buildings as diverse as Bed and Breakfast Inns and historic farmhouses to create authentic interiors that include the best of today’s lifestyle all the while respecting the buildings’ architectural integrity. 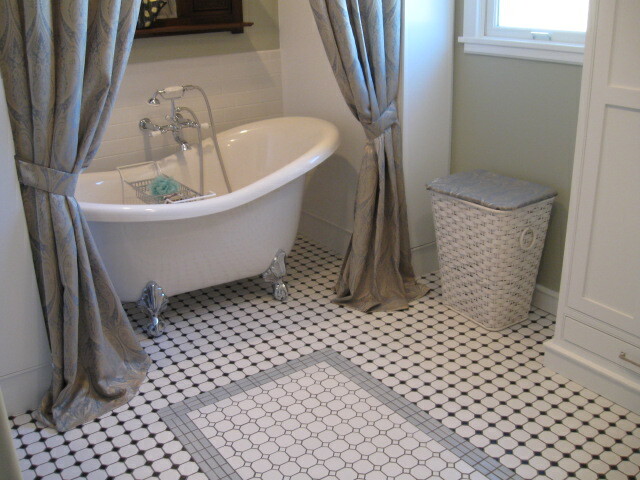 Custom designed floor in bathroom. The building’s interior has lost most of its architectural character. Knowing what to replace, what profile of millwork to use, and what is original to the building is important. As a presenter for the City of Edmonton’s “This Old Edmonton House” series of workshops, these are some of the most common questions I help people with. Should I use antiques? 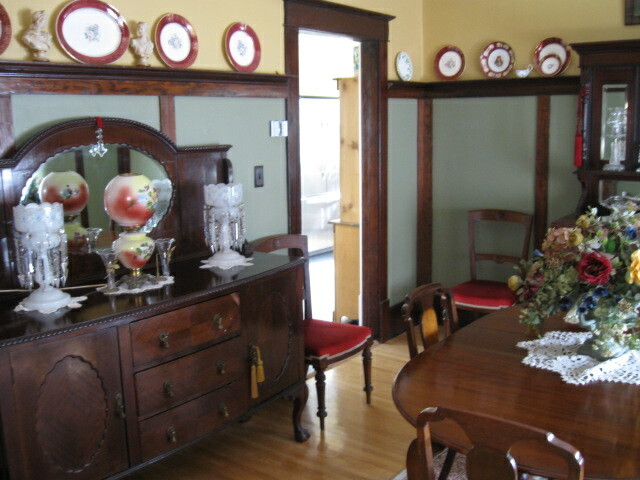 Antiques are an important element of most historical interiors. As a previous antique dealer and restorer of antique furniture I can help you choose the best pieces for your needs and advise you on how to maintain those you already own. You won’t have to worry about an overzealous decorator tell you to paint an important piece thus ruining its value for the future! But I prefer modern furniture! Modern furniture can look great in a heritage building. The trick is to know how to choose pieces that are in scale with a historic interior. I can help you choose great looking furniture that won’t overwhelm your space yet create the feeling and comfort you want. I’m interested in protecting my building from demolition by pursuing historic designation and I’d like to know how I might be able to access money to restore it. You’ll need some contacts. As a member of municipal heritage boards and associations I can let you know what you need to know and who you should talk to which will save you time, frustration and money. But I prefer to do the work myself. DIY’s are some of my favourite kinds of clients to work with. I can help you by being an expert third party or “fresh pair of eyes” and act as a sounding board for the many decisions you’ll have to make throughout your project. For more information on how I can help you or to discuss your particular project please call me at 780 722 7494. Alternatively you can contact me via email by leaving me a message at this link. Union Bank Inn, as part of Designer Showcase event. Many owners of historic homes throughout the city of Edmonton and in Calgary. Owners of contemporary homes too! 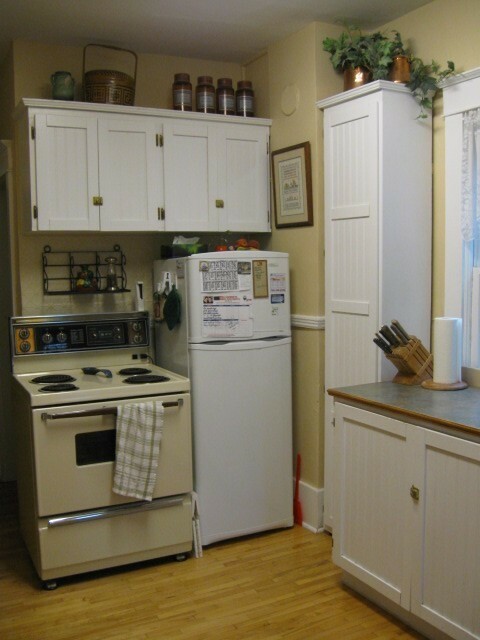 So why hire a regular interior decorator to help you with your project? Give me a call at 780 722 7494 or email me to discuss your needs.